Designed with the perfect balance between convenient and high quality, this Greenmount garden nozzle offers you good large shutoff handle which can easily switch ON and OFF for all ages of garden lovers. 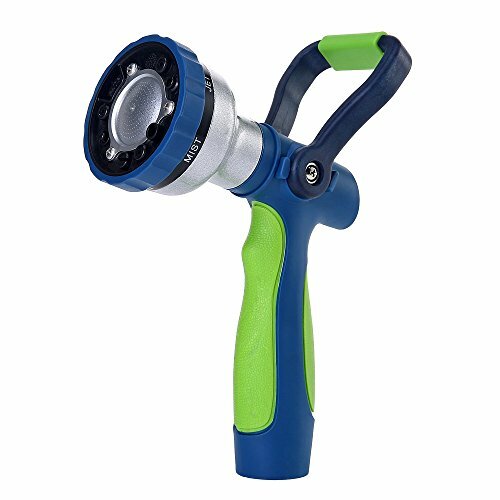 Especially for customers with arthritis in hands but love gardening, the convenient handle easily solves the problem that they have to squeeze a trigger to make the water flow all the time. Greenmount hose nozzle is made of solid zinc alloy, robust and much stronger than plastic water nozzles. Our spray nozzle also has a high quality anodized finish to prevent rust, corrosion and wear. The green shock resistant rubberized bezel dial protects the hand sprayer from accidental impacts. No matter you need high pressure jet to clean hard surface or soft shower to water seed starts and young plants, our adjustable nozzle can meet different watering needs. Together with Greenmount, we make your garden green again. We continuously innovate our products to give you the best and latest features to accommodate to your lifestyle! Step 1: Pull the hose straight to remove any twists caused by package. Uncoil the straighten hose to full length. Step 2: Connect the female coupler of hose to the water faucet and the male coupler to the water nozzles. Step 3: Ready to use. Enjoy the watering fun time with family. 1. Ensure the nozzle is aimed in a direction that is safe, prior to opening the shutoff bale. 2. Slowly turn water on full and let trapped air out of nozzle. If you have any questions about this product by Greenmount, contact us by completing and submitting the form below. If you are looking for a specif part number, please include it with your message.